The GSM Flasher ADB Bypass FRP Tool for your android phone is available here to download free. Just click the official download link given below of the article and easily download the GSM Flasher ADB Bypass FRP Tool only a few seconds. Hello' guys today we come up with the GSM Flasher ADB Bypass FRP Tool here our Web Page which is download free of cost from at the bottom of the article for its official download link. Every users has confused that what is the GSM Flasher ADB Bypass FRP Tool? So, in this article we can sole all of your problems.It is 100% sure that the GSM Flasher ADB Bypass FRP Tool is scanned by Anti Virus software.It is one of the best and awesome tool avail here Website which allow you to ByPass FRP lock on your android smartphones and Tablets.You can easily ByPass FRP lock on almost all android devices like Samsung, Oppo, HTC, LG, Huawei, Lenovo, Micromax and much more.The GSM Flasher ADB Bypass FRP Tool is 100% sure that working. It is one of the best tool. In android OS ADB is very important command that enable you to communicated with your android device functions like applications and debugging your android devices.The latest tool has been launched with its more unique features given below of the post. 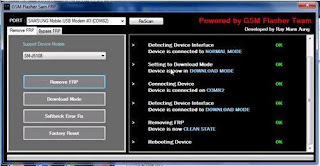 How to use GSM Flasher ByPass FRP Tool? Here is the list of guideline points to use the GSM Flasher ADB Bypass FRP Tool as under. First download the GSM Flasher ADB Bypass FRP Tool from the right link. The download its ADB driver. Launched GSM Flasher ADB Bypass FRP Tool. The connect your device with computer via USB Data Cable. In last Click the remove FRP button. After complete this you will success in your mission. Here is the list of unique features of this latest tool given below. It is compatible with all version of Android OS. Remove FRP lock on all android devices which having any android version.